There’s something about state fairs that brings out the best America has to offer in terms of food creativity. Screw molecular gastronomy, I want to know what the latest in fried, bacon-wrapped and Flaming Hot Cheetos is in the world. 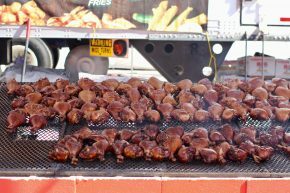 And while the Arizona State Fair isn’t known as well as some others, there was still room for some interesting bites. One thing I didn’t bite, by the way, was a turkey leg, because, well, booooring.